Growth Hormone BoostersTrec GH Turbo - 120 kaps. 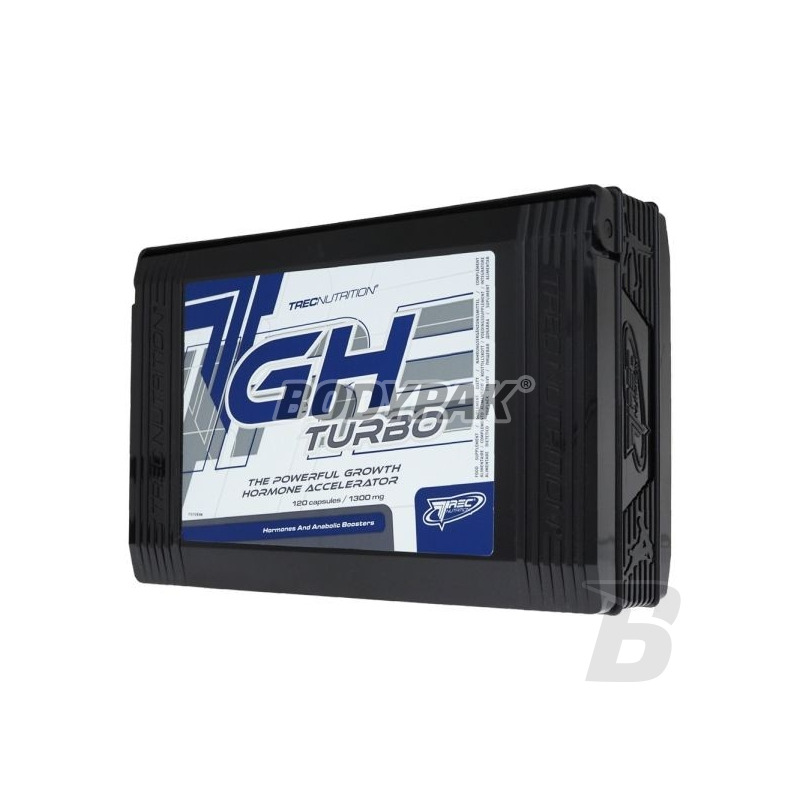 Trec GH Turbo - 120 kaps. The unique amino acid composition, which promote the production of somatotropin - human growth hormone (HGH). Maintaining high levels of this endogenous hormone is extremely important to maintain high physical performance. High quality and efficiency! 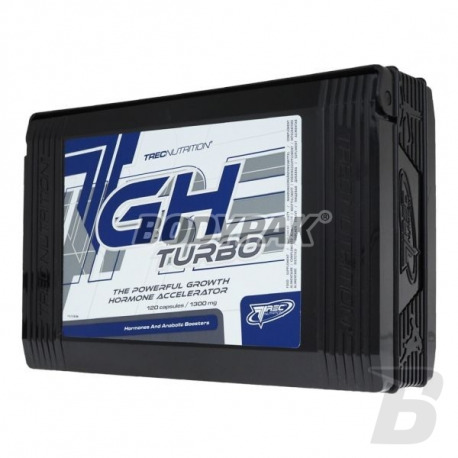 Trec GH Turbo - 30 kaps. 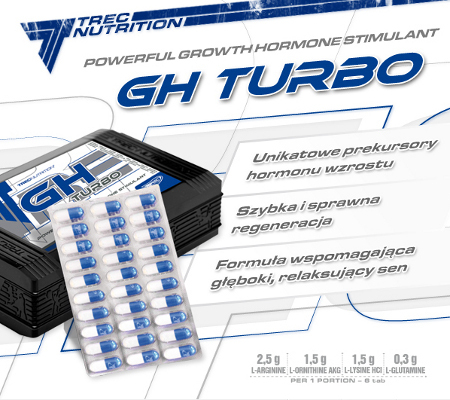 TREC GH Turbo is a product comprising a unique combination of amino acids that promote the production of somatotropin - human growth hormone (Human Growth Hormone). U athletes and active people to maintain high levels of this endogenous hormone is extremely important to maintain high physical performance. Somatropin increases the growth of lean muscle mass, reduces subcutaneous fat reserves, increases energy production, supports the libido and accelerates the regeneration of the whole body especially after intense efforts. You sleep, but your body is still working! At night it turns into a big construction site, where the leading role is played by the most important hormone responsible for the rate of regeneration of the whole organism - somatotropin. Growth hormone (Human Growth Hormone) acts as a supervisor that manages the where, when and how fast to be rebuilt as a result of intense exercise damage. Proper night regeneration of the body and uninterrupted deep sleep underlie success in every sports discipline. Unsupported perfect diet, pour himself sweat in training, you use supplements, and your efforts are still not produce satisfactory results? This may be a low level of your growth hormone! Somatropin is a polypeptide hormone made from a specific chain of 191 amino acids. It is produced, stored and timely released into the bloodstream by the pituitary gland. The level of growth hormone is regulated by specific proteins produced in the hypothalamus that control its production. The amount of somatotropin in the body decreases with age and is also largely dependent on our diet and lifestyle. Deficit growth hormone can affect each of us and adversely affect the overall health of the whole organism. Most often the symptoms are directly identified. Many of them received a mistaken as symptoms of overtraining and decrease overall vitality. The most important period in which pulses are released into the bloodstream high doses of this hormone is the deep sleep phase (REM). Shallow sleep, poor diet in key amino acids and too intensive workouts make the night somatotropin is secreted in smaller quantities, and the regularity of her remorse is impaired. As a further consequence this leads to a loss of efficiency in training and changes in body composition - reduction of muscle mass and increased fat. On the part of the nervous system begin to tease us mood swings, poor concentration and aversion to physical activity. HOW SAFE LEVEL INCREASE GROWTH HORMONE? Taking into account the construction and method of the somatotropin biosynthesis in the body, there are several ways to improve the efficiency of the process. First, you must increase the supply of growth hormone precursors - amino acids have a particularly large amounts are present in a molecule. The researchers observed that the high concentration of min. L-arginine, L-ornithine, L-lysine and L-glutamine not only a beneficial effect on the process of muscle regeneration, but also contributes to an increase in serum growth hormone levels in the blood. Bearing in mind that the greatest amount of somatotropin are secreted mainly at night, we should increase the frequency of occurrence and duration of the phases of deep sleep. Fulfilling these two conditions at the same time we can be sure that the process of production of growth hormone in our pituitary gland and its secretion (secretion) runs smoothly and with maximum intensity. Jak opisuje producent - brak skutków ubocznych lepsza regeneracja, najwyzsza jakość produktu. Godne polecenia!